The 67th session of the WHO Regional Committee for Europe (RC67) opened with an organ recital by Mr Gergely Rákász. Through compositions by Aaron Copland, Zoltán Kodály and Johann Sebastian Bach, he illustrated the linkages between history, music and health. In his opening remarks, WHO Director-General Dr Tedros thanked the Hungarian Government for hosting RC67 and recognized its efforts to address the issue of unhealthy food. Dr Tedros then appealed to Member States to ratify the Protocol to Eliminate Illicit Trade in Tobacco Products. Nine Member States in the WHO European Region have already done so; globally, 11 additional states must ratify it by July 2018 for it to come into force. “There is the power in this room to bring the Protocol into force,” he said. Expressing his deep appreciation and support for the work of WHO, Prime Minister Orbán explained that the word for health in the Hungarian language – egészség – combines the concept of health with being whole and complete and having a full life. This broad idea of a whole, healthy life informs government policy in Hungary. Several health-related action plans implemented in Hungary in recent years have achieved positive results. For example, tobacco control measures, including banning smoking in enclosed spaces, led to a decline in the number of people who smoke regularly from 28% in 2012 to 19% in 2013. A so-called chips tax, levied on unhealthy foods, has resulted in half a billion euros in revenue. This has been directed to the health sector to increase salaries for health workers. In addition, 40% of actors in the food industry have reformulated their products since the introduction of the tax, explained Prime Minister Orbán. Ms Katalin Novák, Minister of State for Youth and Family Affairs and Minister of State for International Affairs, of Hungary, was elected President of RC67. Ms Dagmar Reitenbach, of Germany, was elected Executive President. Professor Amiran Gamkrelidze, of Georgia, was elected Deputy Executive President. Ms Radvilė Jakaitienėas, of Lithuania, was elected Rapporteur. In her seventh address to the Regional Committee, Her Royal Highness Crown Princess Mary of Denmark, WHO/Europe’s Patron, reaffirmed her commitment to promoting maternal and child health, advocating for immunization, and raising awareness about antimicrobial resistance. The Crown Princess noted with concern that 1 in 10 children in the WHO European Region remains under-vaccinated, and that measles claimed 41 lives in the past year. “Leaving no one behind is our call to action,” explained Dr Jakab, setting the scene for an exploration of the Region’s progress and ongoing challenges in public health. This reference to the 2030 Agenda for Sustainable Development and the implementation of Health 2020 was a recurring theme throughout the Regional Director’s address. She underlined the need to place health at the centre of development, and to base progress on the principles of the right to health, equity, fairness, universality and solidarity. Despite an average regional life expectancy of more than 77 years, and an average healthy life expectancy of 68 years, Dr Jakab cautioned that across countries of the Region life expectancy ranges from 70 to 83, and that healthy life expectancy ranges from 60 to 73. Similarly, although infant mortality is at the lowest level ever ¬– 6.7 per 1000 live births – there is a tenfold difference between countries with the highest and lowest levels in the Region. 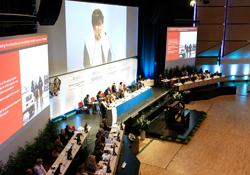 Dr Jakab welcomed the presence of high-level delegates, including prime ministers and deputy prime ministers, at RC67. She pointed out that this is an indication of the pivotal role of health on the highest political agendas. In order to advance public health further, and to address inequities between and within countries, the Regional Director appealed to delegates to transform the way the health sector works. She emphasized the importance of creating synergies across sectors, mobilizing communities and individuals, and engaging civil society by building consensus around shared targets. On behalf of the Region, she also expressed her commitment to universal health coverage. She noted that in addition to providing a platform for the integrated delivery of health services and public health, it also acts as a “powerful social equalizer”. Indeed, the Regional Director made the strong economic case for investing in health, explaining that public health interventions are cost-saving. Research suggests that reducing health inequality by 1% per year would increase the annual growth rate of a country’s gross domestic product by 0.15%. “Health inequalities affect everyone, not just the poor. The consequences for a country are poor economic performance, long-term social injustice and, ultimately, political instability,” the Regional Director added. A representative of Estonia, currently holding the Presidency of the Council of the European Union (EU), spoke on behalf of the EU. She thanked the Regional Director for her report, and expressed appreciation for reducing the reporting burden on Member States. This was done through the development of a common set of indicators on noncommunicable diseases (NCDs), the SDGs and Health 2020 together with the Organisation for Economic Co-operation and Development (OECD) and the European Commission. The delegate also underlined that antimicrobial resistance continues to pose a serious threat to health, and drew delegates’ attention to the new action plan to tackle antimicrobial resistance adopted by the European Commission in June 2017. Many Member States concurred with the statement. The Minister of Human Capacities of Hungary explained that, since 2011, the government portfolios of culture, health care, family, sports, civil issues, and minority affairs have been brought together in order to facilitate coordination and advance intersectoral issues such as early childhood development. A delegate of Bulgaria, speaking on behalf of the member countries of the South-eastern Europe Health Network, explained their commitment to implementing the 2030 Agenda, set out in the recently endorsed Chisinau Pledge. In addition to outlining key developments at the national level, European Member States identified other issues in plenary, including: the importance of health literacy and developing indicators; a continued commitment to addressing environment and health; the importance of strengthening tobacco control; the recognition that universal health coverage is the cornerstone of health and well-being; the need to ensure sexual and reproductive health and rights; and the need for continued action on communicable diseases – including tuberculosis and HIV/AIDS – and on NCDs and their risk factors. Delegates also expressed their appreciation for the establishment of WHO’s Health Emergencies Programme; the Organization’s normative and standard-setting role; its technical support in developing national health strategies; its guidance in translating evidence into policy; and many other areas of collaboration. Keeping the world safe, improving health and serving the vulnerable are the 3 building blocks at the core of the Draft concept note towards WHO’s Thirteenth General Programme of Work 2019–2023. Dr Imre Hollo, Director of Planning Resource Coordination and Performance Monitoring, introduced the concept note in plenary. Close alignment with the SDGs, a focus on outcomes and impacts, and the placement of countries at the centre of WHO’s work are just a few of the major shifts it proposes. A delegate of Estonia, on behalf of the EU and its Member States, commended the document, adding, “It marks a new chapter for WHO and global health.” Delegates were pleased with the consultative and inclusive approach, and indicated their support for the proposed fast-tracking of its consideration at the 142nd session of the Executive Board in January 2018. At this informal meeting, heads of delegations raised many issues with Dr Tedros. They focused in particular on how WHO operates, from anticipating new priorities for global health to encouraging intersectoral work, strengthening collaboration across regions and shifting the focus from processes to outcomes. The Director-General responded by acknowledging that many WHO programmes work in a fragmented manner, and that WHO needs to involve other organizations in the United Nations family and beyond. He also noted that steps are being taken to ensure that the WHO regions collaborate more closely, for example, through the Global Policy Group mechanism, and that the Organization embraces change. He encouraged Member States in the European Region to share their experiences with other regions, and added that he will strengthen WHO’s country presence and country offices to support ministries on political issues, messages and advocacy to promote health. In order to promote work across sectors – which is necessary to achieve the SDGs – Dr Tedros proposed that Member States establish multisectoral committees at the national level. In conclusion, he once again appealed to Member States to ratify the Protocol to Eliminate Illicit Trade in Tobacco Products. This briefing provided an opportunity for Member States and nongovernmental organizations (NGOs) to share their experiences and challenges in providing equitable immunization services to refugees and migrants. Representatives of Germany, Greece, Italy, the Russian Federation, Sweden and Turkey explained the steps they are taking to vaccinate the large influx of migrants to their countries in recent years. They identified specific challenges, including: inaccurate data collection on immunization coverage due to decentralized systems; the difficulties general practitioners face in obtaining informed consent from patients, and in reporting on potential adverse events; the vast range in vaccine pricing; a lack of information on immunization services in origin countries; vaccine hesitancy; and a lack of health workers to provide services. The briefing was a first consultative step in developing technical guidance on immunization and migration in the Region. On 10 September 2017, Minister of Health of Romania Professor Florian-Dorel Bodog and WHO Regional Director for Europe Dr Zsuzsanna Jakab signed a BCA setting joint health priorities and areas of work for Romania and WHO/Europe for 2018–2019. The same day, Dr Arben Taravari, Minister of Health of the former Yugoslav Republic of Macedonia, also signed a BCA with Dr Jakab for 2018–2019. Members of the Standing Committee reviewed the programme and agenda for RC67, and received a briefing from the Regional Director on significant events that had taken place since their last meeting. Dr Jakab underlined the high-level political participation this year. She also shared a new approach to introducing agenda items, in which individuals from across the Region share their experiences and expertise in a series of videos – the Voices of the Region. Thirty-five representatives of NGOs were briefed on the RC67 agenda, as well as the proposed process for accreditation as non-state actors in working relations with WHO/Europe. They were encouraged to engage in discussions on social media using Twitter hashtag #RC67. On 7 September 2017, the Ministry of Human Capacities of Hungary and WHO/Europe held an opening press conference. Dr Jakab and Mr Zoltán Balog, Minister of Human Capacities of Hungary, met the press to present the meeting’s agenda and talk about public health progress, challenges and solutions. The press conference was widely covered by national and regional media.